Can a New Player Enjoy Eve? Are you, or one of your friends thinking about playing Eve? Do you wonder if people like it? (the answer is yes, by the way. Consider that a spoiler). As Retribution comes out and CCP seeks to lure new players to Eve I figured now was a good time for one of those, "To play or not to play. That is the question," type of posts. Play it. 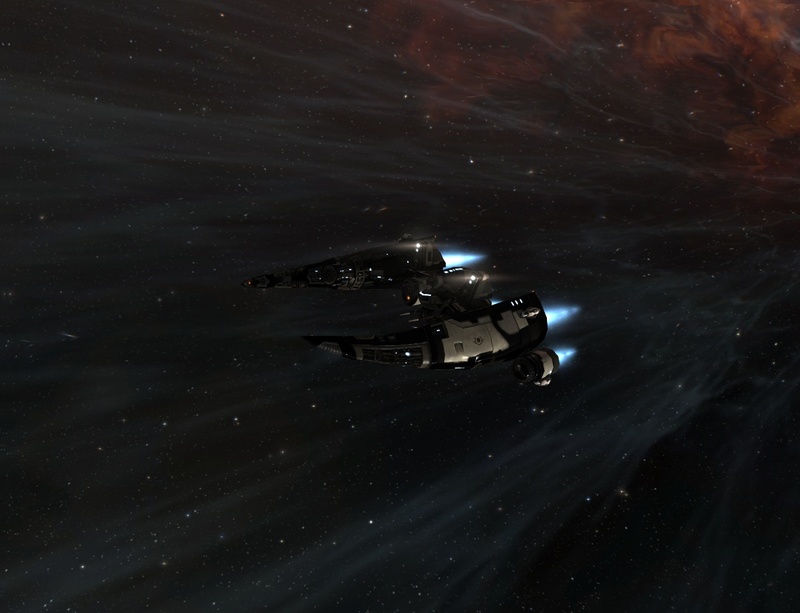 Eve is beautiful. It's a game where you can just soak up the universe. I was rummaging around on the steam forums. Steam currently has a $5 to start playing offer. This is cheap enough that it often brings new players into the game to give it a try. As an Eve player, the negative opinions that people have about Eve often amuse me. They are many times formed from a lack of knowledge or a bad situation. With most games focused on feeding the positive reinforcement the negative reinforcement that many Eve players thrive on is abhorrent to some. I can see it all over the forums. Eve was hard for people so they give it negative reviews. Yet, that is not the barrier that I read about the most. 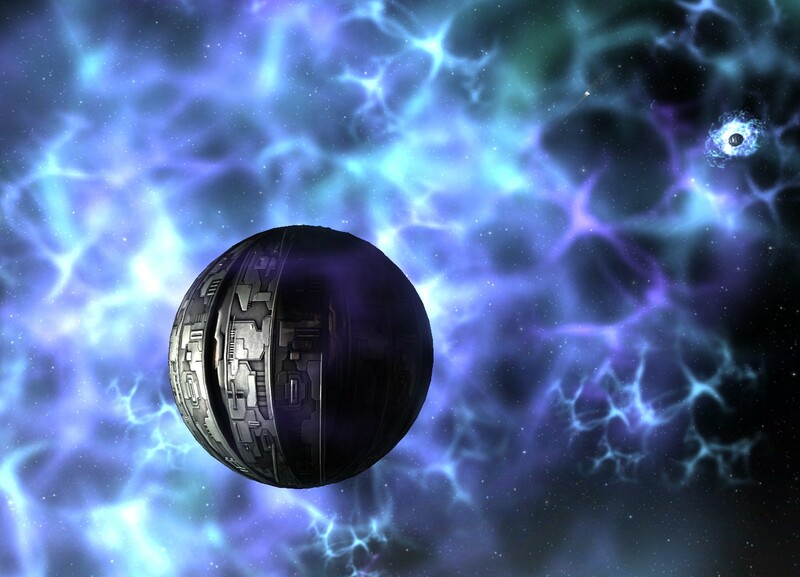 Until they experience Eve, the rumors of loss and the finical impacts that the player base takes in stride are not fully understood. What most people focus on is the age of the game. Eve is 9 years old and it does not have a 'max level'. Can a new player catch up? The answer is yes. The reason is because Eve is not a game of levels. The concept of levels means that there is a cap. With obsession and a lack of solid food and bathing one can gain those top levels at an incredible rate. But Eve has stripped that away, stomped on its head and laughed. It is a game of skill points that you do not need any actual skill to gain. What you can do and how well you can do it matter. The is an initial time dump but that time dump is in any game. What scares people about Eve is that you can never catch up to someone in time. People compare this against their experiences in other games and come up with the incorrect summary that they can not succeed in Eve unless they started playing it nine years ago. No. No because Eve does not have levels it has skill points. Also, because you do not need to do anything to learn skills the only thing left to learn is player skill. Playing the actual game, the task of it, is what can become so consuming and take so long to learn. But skill points are levels, no? Each skill has a level of 1-5. Each of those takes a period of time to learn. So if you are level 5 and I am level 1 then you are better. To a point, sure. But that is a tainted view. Eve's skill point progression is permanent Once the time is done the skill is given and it is the same as anyone else with that skill. If someone has Gunnery Rank V and you have Gunnery Rank V then your Gunnery is the same level even if they are 9 years old and you 2 weeks old. It is never that simple. There are tons of support skills and all sorts of delightful complex things to keep us occupied. However, their Gunnery skill stops at V. They don't get Gunnery VI or VII. Their Gunnery V is not any more powerful then your Gunnery V because it is older. What must be pointed out, regularly is that once a skill is achieved it is achieved and the length of time in game does not matter. Similarly, each module and ship and task has a set of skills related to it that are static. If these skills are all achieved then they are the same. The most common example is for frigates. Frigates are the smallest ship class that a player has to specialize into. Because they are small they are considered an 'easy' train. 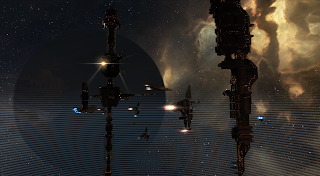 Easy trains in Eve generally mean short amounts of time. A 2-3 month train to get into a frigate that can compete with the veteran players at the same skill level. While it may sound like a lot of time Eve is not an overly fast game and it is one of planning. While 2-3 months may sound unpleasant I lay it on the table to point out the fact that it is accomplished in 2-3 months not 9 years to reach the level of an experienced player in a situation. If that is still too long then instead of saying, "Eve is not for you," I'd still suggest a person try it. What time in game gives players is access to more options. Or, I should say, useful access to more options. A new player can get into most Battleships and below in just over a week. It would be a terrible thing to have happen and they would not have any decent skills to fly the ships but it is doable. But playing Eve is a matter of strategy and far thinking. Perhaps it is the space ships and lasers that confuse people some. And the trailers are romantic. Action and adventure await. Yet many people descend into a life of mining and spread sheets while we sit over our morning coffee looking at the finical charts at the trade hubs. I'll be honest about that. Yet, its amazing how relaxing it is and how one will find themselves three hours past their bed time passionately work out the most effective way to build a fleet of spaceships. Then said fleet of spaceships is taken out and thrown into massive battles full of carnage and destruction. It just takes a bit of planning. But is Eve casual? I lean on the side of, "No" but in truth it can be. That is the fun part about the sandbox. Someone can jump in and jump out of the game. The game does not penalize you. However, I would caution anyone that wanted to play that the social nature of Eve is what consumes most of us in the end. Eve is a social game. That is where it excels. The game is not structured around a single player and it fails, considerably on that level because it is not meant for that one. Eve is better with people. There are plenty of people out there to help a new player along. Thanks to the fact that we are rewarded for corporations, under all of the darkness and evil the scams and the explosions there is a group of people who understand the value of 'paying it forward' and bringing people into the game. A new player can find themselves drowning in a ocean of help far deeper then the initial one of confusion. That is the key to all of this. 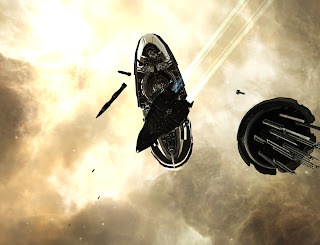 To picking up Eve as it approaches its tenth birthday. It is about the people and it is built upon a system of corporation. You don't have to go at it alone. Go at it with other people and things like skill point differences will evaporate as you enjoy the hell out of yourself. For people debating trying Eve, why not? Try it. Meet some people. Do some stuff. You are right, there is no reason for a new player to don't ENJOY the game. Of course he won't WIN it, he won't be a 1v1 master or leader of a coalition or rich overnight. But he can always find fun bits. Bit of offtopic, how did you get that "Click here for a free 21 day Trial of Eve Online!" link? It's probably called your "open invite" ID that you got to invite multiple new friends. I forgot to answer this yesterday. When they changed buddy invites they made perm links that someone can activate to get a 21 without asking and the links owner gets game time. Its under your buddy invite section in accounts management. Then I made a super honest blurb about it so people know what happens. The social part is true and one of the first things I did was join Eve University. I learned a lot of basics and got past the learning cliff. I'm a bit of a loner in-game now but blogging and tweeting helps keep up with the community. I can add one thing about the skills and catching up. My main character is over 3 years old and I think Sugar Kyle's one-year birthday is coming up. If you put us both in either a Jaguar or a Hurricane and let us 1v1, who do you think is going to win? The old carebear who records one kill a year or the young pirate who PvPs everyday? Even with a skill point advantage (and probably not much of one if just referring to the skills needed to fly a Jaguar), my best move is probably running away. Why? Because she has a lot more skill piloting against other players than I do and in Eve that means a lot. I did level 2s but you cannot really earn anything worthy... it's like 5 millions isk per hour right ? At this peace mining is much more profitable and at least you can afk a bit. And sadly to fly decently a cane it takes almost 6 months, less for a jaguar true but after one year you can fly either of these two ships perfectly (or close enough that it doesn't matter). 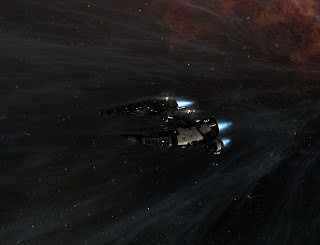 To be honest i think 1v1 in eve is often a coin-flip match, be it in a frigate or bc, i might lack experience to really make my point but i have over 300 kills (with a character i bought on the market by the way) so i am no longer a newbie in that field. "(i cannot follow doctrines : one day it's zealots, the next one nagas...)"
Sounds like somebody joined -A-! lol. Seriously, though...all of those "doctrines" all allow for interceptors (what, 2-3 weeks to train to near-perfect skills? ), dictors (3-4 weeks), and cloaky probers/scouts (1.5-2 months). And those roles are, to me, far more fun than just being the derp who hits "keep at range" on the anchor and does 'pres butan' on F1 when told to. Just saying. I joined EvE 3 weeks ago. I am having great fun. I can run missions and with the aid of my corp/alliance, I've been flying frigates running tackle on group roams in low and null sec. I've lost a couple ships and have been podded, but it's been fun. I've started looking into mining and industry from my corp exposing me to weekly mining ops and learning how to supply the corp with ammo. The cool part of EvE is there are many avenues you can explore and tinker in.